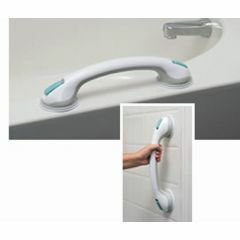 Complete Medical Products Sure Suction Rail with Heavy Duty Suction, 16.5"
The Sure Suction Tub Bar provides assistance where and when needed. Simply clean and dry the surface then press the cups down and flip the blue lever. The no-slip grip rings cover the entire grip length. Sure Suction is constructed of engineering grade polymer resin, non-marring suction cups and chrome plated internal hardware. Installs in seconds with no drilling. Easily reposition to the ideal location for each user. Engineered to fit 4”, 6”, 8” and 12" bathroom tiles (place on smooth surface only – no grout lines). Use on fiberglass shower enclosures as well. Suction cups are 3.5" in diameter. DOES NOT ADHERE WHERE 4' CERAMIC TILE IS GROUTED. I CAN'T USE IT. Master Bathroom. Guest Bathroom. Large Bathroom. Gifts. 4-1/2 stars. I have shiny, smooth, almost glass-like 8"x10" tiles in my tub. In other words my tiles are perfect for use with this product. Before installing, I cleaned the tiles and cups with rubbing alcohol and dried all surfaces. I check the integrity of the bond before each use, but the bond will last MONTHS without reattaching. This is important to me because I use this bar for support. If it should slip or come loose, I would probably fall in the tub. I don't put much weight on it but I do push and pull on it a bit to get in and out of my tub. I can't vouch for rough, porous or tiny tiles, but on a smooth clean surface the suction is awesome and safe. They only con is that it's a bit slippery when wet. I wish it was rubberized rather than knurled. That's the only reason for 4 stars rather than 5. I plan to buy a second one. Durable. Easy To Use. Good Value. Attractive Design. Each suction cup must apply directly on the tile and cannot cross a grout line or it will not hold. I have 4x4 inch tiles so only one end 'grips'. However, we use it only for balance so it still works for us. Textured grip surface. Easy To Use. Good Value. LIGHT BALANCE AIDE only. Does not work all walls. Standing in tubshower. Walk in shower. Medical professional. Bargain Hunter. Practical. If you only need a light balance support, this is really neat. I don't recommend for placing near tub for pulling up out of the tub, or leaning ont it heavy or pulling on it heavy. Many folks don't have means to have bars installed. Only works on certain smooth surfaces but versatile position options. Easy to install but follow directions suction cups need to be kept in good condition, etc. e.g. of use post hip surgery if can stand fairly well. I was originally skeptical, but once helped patient set one up, was surprised. We even got it wet to be sure it was still secure after wet. The bar will not fit on standard 4 inch tiles. One end cannot lock over the goove between tiles so you can only grip one end. It still works but it would be much better if it was 1 inch longer. This product would not stay on the wall. Could never use it in a regular smooth wall shower. Was reluctant to buy, wish I had not.